Edinburgh is home to a multitude of whisky bars, but for every establishment full of rare and wonderful drams, you will find many a tourist trap to be avoided. With the Edinburgh Festival Fringe due to get under way tomorrow (4 August), Tom Bruce-Gardyne picks out eight of the city’s best bars and whisky experiences – from the biggest, most varied collections to the cosiest neighbourhood gems. Wherever you emerge in Edinburgh, be it off the airport bus or at Waverley Station, you may well be greeted by a sweet, beery aroma blowing in from the east. The Caley, one of 40 Victorian breweries, is the sole survivor in a city with a tremendous history of brewing and distilling. Centuries earlier, Edinburgh once boasted 400 stills, of which only eight were licensed. 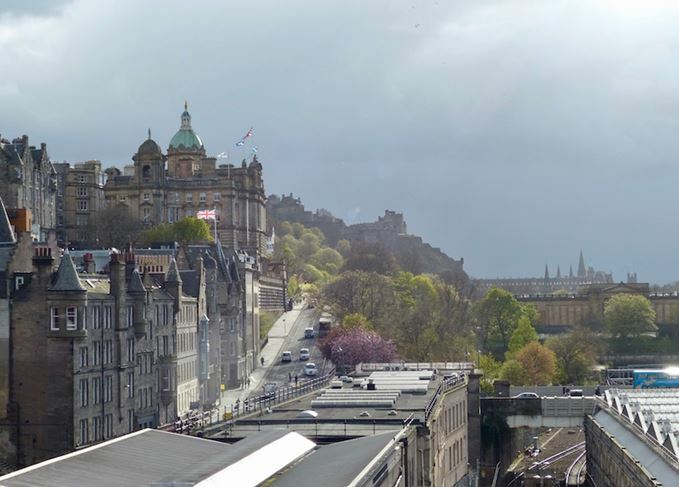 No wonder they called it ‘Auld Reekie’. Today, craft breweries are sprouting everywhere, and distilling has returned to the city with gin and, soon, whisky. However Glenkinchie single malt distillery – the closest visitable whisky distillery to the city – is just a 30-minute drive away, and you can always marvel at the size of North British from the gates (should you wish). Needless to say, there are some great whisky bars and attractions if you know where to look. But beware if you don’t, for there is no shortage of tartan-clad tourist traps to avoid like the plague. Head for the Castle, and your pre-booked morning masterclass before the punters arrive for their barrel-ride through whisky history. In August, you’ll have to battle your way up the Royal Mile past the Festival crowds, jugglers and fire-eaters, but it’s worth it. Here, at the summit of the Old Town before it slides down its precipitous ridge to Holyrood, the views are spectacular. Inside the Scotch Whisky Experience you will be taken through the Claive Vidiz collection of 3,384 backlit bottles, some unbelievably obscure, before a serious whisky work-out. There will be aroma pots to sniff, including pear-drops, vanilla and smoke, followed by a tasting of grain whisky, new make, cask strength and Islay. Afterwards you can try some of the 450 drams offered in the Amber Bar, splash out in the shop or move on – safe in the knowledge that it’s all downhill from here. Propelled by gravity and dodging the selfie sticks en route, you will eventually reach Advocate’s Close – one of the many tiny, atmospheric side streets that form the ribs off the spine of the Royal Mile. The Devil’s Advocate is housed in a converted pump house whose Victorian gloom is lit up by a gleaming array of whiskies behind the bar. Alongside some excellent Scottish tapas and cocktails, you will find a riotous profusion of Scotch single malts, Bourbons and drams from Denmark, Taiwan, Tasmania… you name it. There are bars with bigger ranges, but none so eclectic. With more than 300 malts to enjoy, this cosy wooden pub is a true shrine to the water of life. Located halfway down the sweeping curve of Victoria Street, the Bow Bar has a solid, confident feel and, unlike some of its hipster-filled neighbours, is not trying too hard. It’s just a music-free joint to drink and converse in, and perhaps indulge in a mouth-filling pie from Finlay’s of Portobello (the city’s best butcher, bar none). Afterwards you can browse the curious bottlings across the road in Demijohn, Edinburgh’s liquid deli. If you are feeling flush or adventurous, or ideally both, you should make a date with the in-house whisky bar at the Balmoral Hotel. As per its Highland namesake, there’s plenty of well-stuffed tweed and the odd stag’s head, but there are some funky cow skin barstools too, and the guys behind the bar are young and enthusiastic. Ask for Chuck and you’ll be in excellent hands as you lay siege to the wall of bottles – although, with 500 to choose from, you may never re-emerge. For something very different, head across the New Town to Stockbridge and a real neighbourhood basement bar. It may stock one-tenth of the Balmoral’s whiskies, but The Last Word has an evolving, well-conceived list. There’s an affinity cocktail cask on the bar, beside a living cask from the last drops of leftover whiskies, but best of all is the break-even bottle. Dubbed ‘socialist drinking’, it involves a bottle apparently destined to be fondled, traded but never drunk, that is cracked open and sold at cost. At the time of writing, it’s Connoisseur’s Choice Rosebank 1990 – at £6.43 a nip. On Queen Street, the Scotch Malt Whisky Society (SMWS) has its embassy for non-members, where you can discover what it’s all about – namely, single cask malts whose identities are hidden behind a number and some psychedelic purple prose. At the Kaleidoscope Bar, they will point you in the right direction, but seek out the moreish 'G'-spot bottles of aged grain whisky as well. On leaving, you may find yourself a signed-up member at less cost than a Netflix subscription, and next time you can enjoy the society’s headquarters venue in Leith. Opened in 2015, this large, city-centre basement bar has another huge collection of whiskies on offer, from the usual suspects to single cask rarities from silent distilleries such as Brora and Port Ellen. It lacks the neighbourhood feel of The Last Word, but the bar staff really know their stuff. If you are in a small group, you can drink in their knowledge with one of the tutored tastings. How about a trawl through world whiskies at £26 a pop – or the Luxury Flight that stretches back to a Gordon & MacPhail bottling of Mortlach 1936, for £600? Whiski comes in two different guises – as a bar on the Royal Mile and as the Whiski Rooms at the top of the Mound nearby. This may be tourist central, but both venues offer a welcome respite from the caterwauling bagpipes outside. And they have much to entice whisky lovers, with plenty of single cask and vintage bottlings which, in the bar, you can sip listening to live folk music in the evenings. The ‘Rooms’ stocks around 350 whiskies, many of which you can buy in the shop after first trying a dram, and there are some tasty flights to match with cheese and chocolate. For its size, Edinburgh is blessed with an astonishing wealth of good independent pubs and, for most, stocking a decent range of Scotch is a badge of honour. Any list would have to include such New Town stalwarts as The Guildford Arms, full of Victorian splendour, and The Queens Arms with its stash of malts behind its horseshoe copper-topped bar. Meanwhile, on the Southside is the quirky, family-owned antique shop of a pub known as The Canny Man’s. The Edinburgh attraction has reported its ‘biggest ever year’ as a result of the Brexit vote.